A Building Automation System (BAS) is a network of software and mechanical devices that control energy-consuming equipment (mechanical, lighting, HVAC etc.) in a building. The implementation of BAS maintains or improves the environmental comfort level, generates efficient building operation and lowers your energy and maintenance costs. Simpson Controls can install these systems and more importantly, help you monitor and measure your building's operation and reduce the time you spend managing the site and occupant comfort. Upgrading your mechanical systems is only one part of an effective solution. Our Remote Building Energy Management software allows for easy and accessible real-time monitoring. 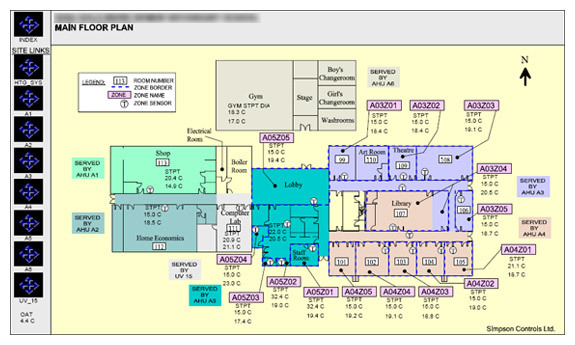 We generate "graphics" of your system by layering colour-coded HVAC zones over your building's floorplans and then add dynamic information supplied by the system's various sensors (room temperature, thermostat, duct temperature etc.). These graphics are accessed via remote desktop connection over the Internet and serve as a 24 / 7 real-time "window" into your building's systems, where you can drive or adjust your BAS and associated devices. Simpson Controls centrally manages and secures what users are able to modify on each graphic, allowing for multiple managers with varying degress of accountability. Upgraded systems, proactive strategies, monitoring and tracking of your BAS will translate into time and energy savings. Let us show you how. "Siemens Building Technologies, LTD continues to offering its customers and markets development of new technologies while maintaining support of existing products and solutions in the BAS market." "The best approach for SBT in the Vancouver Island market is to partner with Simpson Controls as our exclusive BAS Partner. We are confident that this type of partnering agreement will allow us to meet the needs of our customers while allowing the market access to the latest technologies and solutions available. As a solutions partner to Siemens, Building Automation Solutions, Simpson Controls will receive our full support in its product delivery, technical support and customer service both now and well into the future"
"We welcome Simpson Controls to our Partner Network." Copyright © 2013 Simpson Controls Ltd.